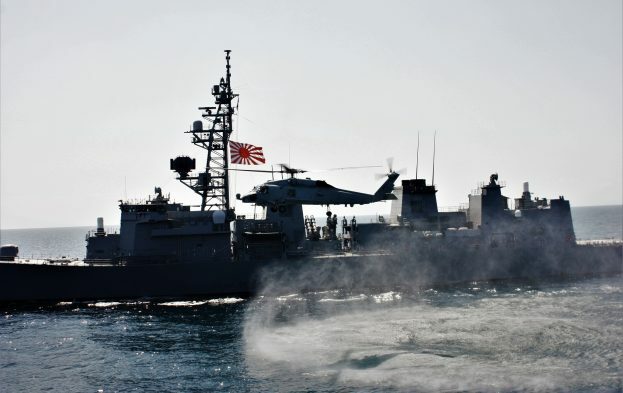 EU NAVFOR ship ESPS Relampago recently met the Japanese Maritime Self-Defence Force destroyer JDS Samidare in Djibouti. Whilst alongside the Commanding Officers met to discuss their ongoing operations in the Gulf of Aden. Meetings like this are important in the continuing development of relationships between participating countries to help increase capability and to deter piracy. The following day the two ships conducted a Passing Exercise (PASSEX) at sea. During the exercise the crew of the ESPS Relampago took the opportunity to train with the Japanese crew and undertook a boarding exercise by fast rope from the Spanish helicopter onto the Japanese ship. JDS Samidare has been operating with the Combined Maritime Forces counter-piracy task force (CTF151) which remains a key partner for Op Atalanta. This and similar exercises underline the importance of cooperation and coordination to EU NAVFOR in its ongoing counter-piracy operations.